life's a beach WALK: The End and The Next Adventure Begins! The End and The Next Adventure Begins! I woke up the morning after I finished Life's a Beach Walk and thought to myself, "Now what?" In all honesty I felt like going for a walk. I wouldn't mind keeping on heading south except for the cold or I could turn around and go back to Byron where I started, revisiting the places I enjoyed the most on the trip. 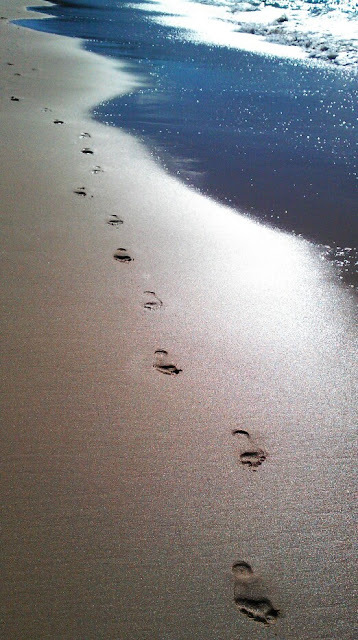 The journeys we take in life often have a circular motion, ending Life's a Beach Walk where my journey with ME/CFS began was more significant than I realised when I planned it that way. And now, day one of my next journey begins here, where my beach walk has ended. Yuraygir, Hat Head, Crowdy Bay, Booti Booti, Myall Lakes. Correspondingly, the days I walked in these places are my highlights of the trip because of the scenic beauty and isolation. My plan for the next few months is to write a longer account of Life's a Beach Walk and maybe turn it into a book to continue my small contribution to raising awareness of ME/CFS. There is a lot of work which still needs to be done. Something I learnt over the course of this trip is that the empathy and understanding of ME/CFS in the general public has increased over the years since I was sick but that the funds which governments put into research and support of the ill with ME/CFS is insufficient. I've also learnt that there are many wonderful people working for better understanding of the disease, many of them sick themselves, and that the network of ME/CFS advocacy is strong. Some of them have helped me along the way and I am grateful for their guidance and support over the last three months. One of the most moving and meaningful things that has happened over the course of Life's a Beach Walk is reconnecting with and meeting new people who currently suffer from ME/CFS. Hearing their stories full of frustration, courage and persistence helped me to remember what life with a severe chronic illness was like. Ultimately doing this walk for ME/CFS awareness helped me to be more aware of my own experience and of the issues which persist for people living with the disease. ME/CFS Australia's website is a marvellous resource. Most significant for me was having access to the accepted diagnostic criteria for ME/CFS. Reading this document was like seeing my own experience described in detail. The diagnostic criteria not only helps people with the disease understand their own experience but importantly gives continuity in medical circles and in ME/CFS research. ME/CFS Australia and the state societies are working to educate GP's of the diagnostic criteria to improve the experience of people newly ill with the disease. The issue of defining severity within the diagnosis of ME/CFS was raised by media coverage I received over the course of this walk. It is little understood in the general public that ME/CFS varies from moderate symptoms through severe illness to critical disease which is life threatening. A percentage of people with ME/CFS suffer from life threatening symptoms. My illness was incorrectly described as life threatening but I was not at any stage critically ill. I did have severe symptoms and was bed bound for five years but my recovery should be seen in the true context of my experience. I have written my story "ME/CFS and me" which can be accessed on the tab above. The Alison Hunter Memorial Fund addresses the issue of severity and works to increase the understanding of the disease across the full spectrum of the illness. The website is a good reference for understanding critical ME/CFS including multiple links to stories of critically ill people. Another issue raised by my experience with media on this walk is one many people with ME/CFS have had to deal with, the invisibility of the illness from the outside and peoples judgement of them because of this. Providing photographic "evidence" of my illness for reprint was nigh impossible and dealing with the old judgements was almost as disturbing now as it was back then. The refrain 'You don't look very sick' repeated by misinformed people can be crushing to people suffering illness and increases their isolation. This issue is not specific to ME/CFS but happens to many people with chronic illness. The online resource of Christine Miserandino is a good place to have a laugh and gain support. I attempted to encourage the media I interacted with to represent ME/CFS accurately in all of its complexity, with moderate success. Hopefully coverage of a good news story on ME/CFS in a variety of mainstream media has helped people to link to ME/CFS Australia and find support. And hopefully my story has given people with ME/CFS some hope. Ultimately I believe the more that ME/CFS is talked about the better the outcomes for people will be. Lastly, if in some strange way having someone do what they love by going for a long walk on the beach helps increase understanding of ME/CFS then I'll put my hand up to do it again! My life is a beach, I like it that way. Thank you for all these links. I live in a small town and it was many years before the doctors began to recognise CFS and I could get my diagnosis. It's been wonderful reading your story and knowing that I'm not alone with this disease and that you can have a full recovery :) :) :). Thank you for the links and the hope!